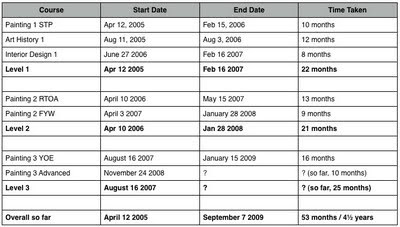 The table shows how long it took to do the OCA courses that I've been busy with for the last few years. The start date is when I received the course materials and the end date is when I sent the last assignment to my tutor. The time taken to select, mount and pack work for the final assessment in each course is not included, but it took about a month of intensive work for each course. I did two courses at a time most of the way through and at one point I was doing three (June-August 2006). I can't predict yet how long the current course will take, it will be at least another six to eight months. The whole BA Honours degree requires seven courses. It's also possible to exit with an ordinary BA after doing one level 3 course. This is where I am now. I've finished and passed Painting 3 YOE and could claim the ordinary BA, and I've seriously considered that. The main reason I've decided to continue is that I'm learning so much with the Advanced course. Note: there were a couple of errors in the first table, these are corrected in the present version. These things are certainly a long slog and staying motivated can be a challenge. I originally did a BSc in 3 years full time. I later did a post grad diploma with the OU in 4 years part time, that took the edge off my enthusiasm! I started with the modules of interest but then ended up doing less interesting mandatory modules for the diploma. Moving from science to arts has given me a new interest but I approach it more on my terms now. I have certainly learned with the OCA but it has left me very disappointed in some regards (e.g. certain tutors, course materials, web site etc). The OCA wouldn't be my choice for another degree, after AOP I didn't fancy the other level 1 courses and moved to a level 2, I don't think I would want to go 'back' to level 1 now so I expect my current course to be my last with them. But completing quickly is not an issue to me. I think I am a better writer for letting my work and style mature. For the last 6 months I've done little else but write on my blog - but it has set me up for the next course, so time well spent I think.